CD, DVD, DVD+DL, Blu-Ray Duplication, Disc Copying, Printing, Packing Services. Professional Disc Duplication, Andover, Hampshire, UK. Disc duplication: the process of taking a master disc, be it CD, DVD or Blu-Ray (the disc you have created, with your data on) and copying it, “bit for bit” using a professional disc duplicator, creating duplicated copies that are the same as the original master disc. Disc duplication, is fast, efficient and usually the most cost effective method for 500 or less copies. With our in-house production, Handisc offers a prompt and professional duplication service. We only use Professional AAA Grade discs, ensuring you have a fully functioning disc. With our stringent quality checks and verification processes, you can have complete confidence in our duplication service and with a wide range of print options available (inkjet, thermal, silkscreen and litho) your disc production wont fail to impress. You then receive your discs, professionally packaged and courier delivered. What disc formats do we copy? Not sure which print method is best for you? Not a problem, speak with our Disc Duplication Team and they will be happy to advise. We are also happy to post you print samples of inkjet, black and colour thermal printing and silkscreen and litho printing, so you can really see how effective each print style can be. If your discs are of a sensitive nature, or you need to keep track of where every disc is, or maybe even require Copy Protection for your DVD Video, these services are all readily available at Handisc. By talking your requirements through with our team, we can ensure your disc is protected, be it via barcode or copy protected, to make sure your data remains safe. 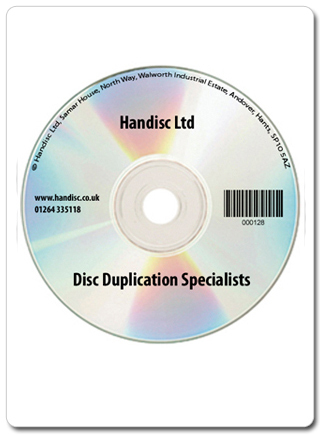 We like to treat each and every disc production as unique, so for your personal price quotation please contact 01264 335118, email info@handisc.co.uk or fill in our “Contact Us” form and a member of our team will promptly respond.